Looking west from Seattle, across Elliott Bay, you’ll see a range of snow-capped mountains. These huge peaks are in the Olympic National Park. 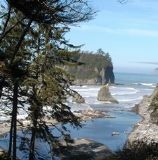 To get a close-up view of this most northwesterly part of the state take a three hour drive west to the Olympic Peninsula. Begin your adventure by boarding a Washington State Ferry at Pier 54 and sailing to Bainbridge Island. Pulling away from the dock you’ll get terrific views of the Seattle skyline and the Space Needle. To the south is the huge Port of Seattle and Harbor Island complex with its enormous cranes that resemble prehistoric birds! On a clear day you might even catch a view of Mount Rainier beyond the port docks. That long stretch of beach on your left is Alki; the original settlers landed here in 1851. The ferry ride takes you to Winslow, a small, upscale community on Bainbridge Island that often makes the top 10 list of places to live in the United States. Leave the ferry; drive Highway 3 over the Agate Pass Bridge and north toward Poulsbo. Once a quaint Norwegian fishing village; modern Poulsbo is known for its delicious bakery, galleries and shops along the colorful main street. Don’t stay too long, the mountains are calling! Cross the Hood Canal floating bridge and you're on the Olympic Peninsula. This is the only floating bridge over tidal water which sees as much as a 18 foot difference in water level each day. Looking for a place for lunch? How about a stop at the Victorian town of Port Townsend? Water Street has a number of dining spots featuring northwest favorites like fish and chips and clam chowder. To see wonderful examples of restored Victorian homes get a map and drive to Uptown. The city of Port Angeles is the next stop. This seaport on the Straits of Juan de Fuca is the gateway to the Olympic National Park. I recommend a stop at the Park’s Visitor's Center. See displays of favorite locations from Mt. Olympus to the Rainforests and Pacific coastlines; pick up hiking and backpacking maps and get information about park weather conditions. If it’s foggy down on the Strait, it can be clear and sunny up the mountain. Consider adding a trip to Canada while you’re visiting the Olympic Peninsula. The Ferry Coho sails from the Port Angeles waterfront to Victoria, British Columbia on Vancouver Island. The Strait of Juan de Fuca crossing takes about 90 minutes so you can spend the day in this very British provincial capital. You’ll need reservations to take your car on the international ferry. You must have your passport to enter Canada. Your driver’s license won’t do! Click on my Victoria B.C. page for additional information. Continue your Olympic Peninsula tour back on Highway 101; drive past deep glacially carved Lake Crescent and west toward the Pacific Coast to see another part of the Olympic National Park. Just south of the town of Forks, go 19 miles east to the Hoh River Rain Forest. It’s a must-see attraction. But, be prepared with rain gear. The average rainfall is over 12 feet of rain a year! Stop at the Hoh Rain Forest Visitor Center to plan your hike through trails of canopy trees and blankets of moss and ferns. The Spruce Nature Trail is one of three easy loop trails and one of my favorites. The Visitors Center is also the starting point for longer, more challenging adventures like the 17-mile trail to Glacier Meadows in view of Mount Olympus. Ruby Beach south on Hiway 101 gives you a first real glimpse of sea stacks and the thundering waves of the Pacific Ocean. I think the trail to the beach is easy to manage and rewarding with great photo opts. Drive to the southern end of the Park along 101 to see Lake Quinault. A stop for the night at the 1926 Lake Quinault Lodge would make a great break. Dinner in the historic Roosevelt Room and views of the sunset makes a restful end to your Olympic National Park visit. Go south on to Hoquiam on Grays Harbor where you’ll find more Olympic Peninsula tour options. If you want to enjoy sports on a sandy Pacific Ocean beach, take highway 109 West to Ocean Shores. If you’re looking for terrific ocean fishing, go on highway 105 to Westport. Deep sea fisherman head to the Westport Marina to pick-up a charter for Salmon or Halibut fishing. Whale Watching, clam digging and boogie boarding off the South Jetty are all favorites is this port. Fun on the sand and in the surf is waiting in Ocean Shores. The whole family can join mini golf, racing go karts, biking, and building a sand castle. Seafood dining, shopping and beach accommodations make this stop special. For a scenery drive; travel east on Hiway 12 toward Olympia and pick up the scenic Highway 101 cutoff to Shelton and Hood Canal. Alderbrook Inn makes a great spot for lunch of local seafood like oysters, clams, salmon, and Dungeness crab. To make a speedier return to Seattle, drive east from Hoquiam to Olympia and then north on I-5 through Tacoma to Seattle.